If you’re looking for healthy slow cooker chili recipes for fall, try adding pumpkin to your chili! Not only does it add great flavor, it’s full of fiber, Vitamin C, Vitamin A, carotenoids, potassium and zinc. My Slow Cooker Pumpkin Chili came out of a blogging cooking challenge. It’s based on Allison of Sweet Flour’s Slow Cooker Pumpkin and Bean Chili. I made chose this crock-pot pumpkin chili because it used canned pumpkin puree. I love the idea of using pumpkin year round as it’s so healthy. Just add pumpkin puree to your chili with a lean meat, some high fiber beans, and chopped tomatoes. And you have a super healthy dish! I healthed up Allison’s recipe by substituting ground beef for ground venison in my slow cooker pumpkin chili recipe. You can also use ground turkey. If you want to use ground beef, choose the leanest kind you can find. Other changes I made to Allison’s healthy slow cooker chili included using a red bell pepper instead of a green one as I find them kind of bitter. I also used vegetable instead of chicken broth as it’s much lower in fat and calories. For spices, I used ground chipotle chile pepper instead of cayenne pepper since that’s what I had on hand. I also used Chugwater Chili Gourmet Chili Blend instead of plain chili powder. If you’re ever in Chugwater, Wyoming, stop at the gas station off the freeway and pick up a jar of it! For easy crock-pot cleanup, use slow cooker liners. They’re WONDERFUL. I love not having to scrub my slow cooker after cooking up a pot of pumpkin chili! If you have room in your Crock-Pot when making Slow Cooker Pumpkin Chili, add a bag of frozen veggies, like broccoli, okra, green beans, or cauliflower. Adding extra vegetables is a great way to sneak some healthy fiber into your family’s diet, plus it creates more chili without much added calories or cost. Finally, I added a tablespoon of pumpkin seed oil. My husband brought a small bottle of this home from a trip to Germany and it makes the Slow Cooker Pumpkin Chili super delicious. It’s also wonderful in Healthy Vegetarian Pumpkin Soup. It’s optional, so don’t worry about if you can’t find it. Looking for more slow cooker recipes? Try this Crock-Pot Cabbage Roll Casserole. Cook onion, bell pepper and ground meat over medium-high heat until meat is cooked through. Add salt and garlic. Cook for 1 minute. Add spices (chili powder through cumin) and mix thoroughly. Cook for 1 minute. Place onion, pepper, meat, garlic and spice mixture into a slow cooker. 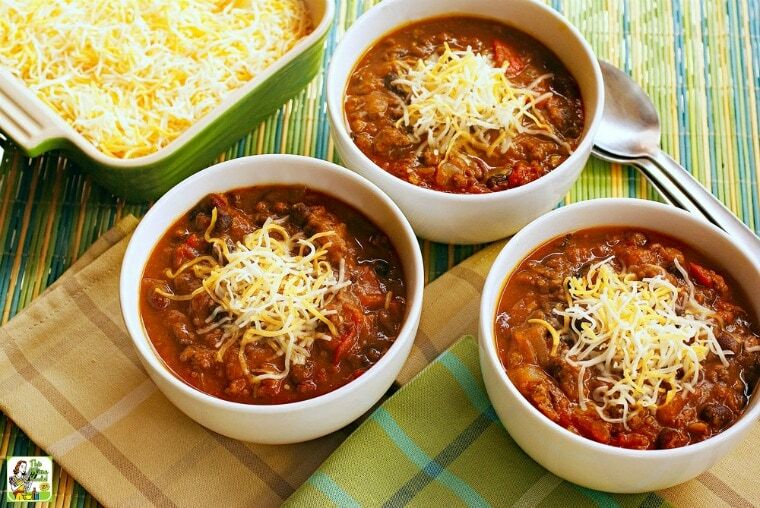 Dish chili into bowls and top with a small dollop of no fat sour cream or a large pinch of shredded cheese. Originally published March 12, 2012. Updated with new pictures and information. Posted in Crock Pot and Slow Cooker, Gluten Free, Recipes, Venison and tagged beef, ground meat, pumpkin, turkey on October 3, 2017 by Anne-Marie Nichols. Next post Need Halloween sandwich ideas kids love? Make a Jack-O-Lantern Cheese Sandwich! 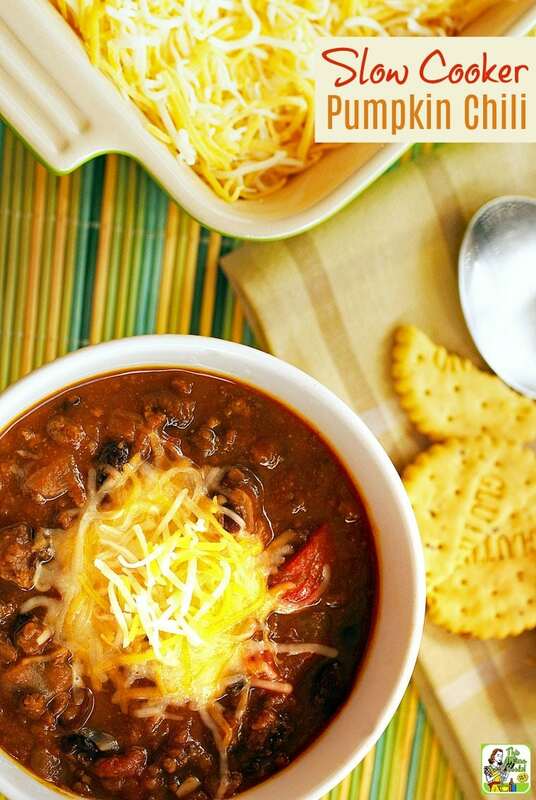 I would have never thought about pumpkin in chili – but love the idea, can’t wait to try it! I’ve made sweet potato chili before, but never pumpkin. Sounds great! what a great looking chili. Nice and thick and comforting. Pumpkin is a great flavour for chili – I’ve made a similar one myself with venison. Great slow cooker recipe. Love the addition of pumpkin. 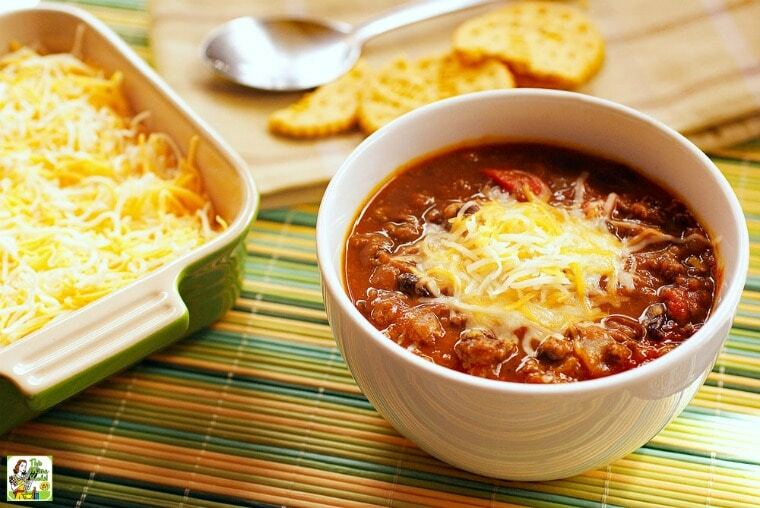 Your Slow Cooker Pumpkin and Bean Chili is a great recipe. I just love the combination of the flavors for this recipe. It is fun cooking with you in the SRC and have a great week! I’m saving this recipe, it looks delicious. what a unique flavor combo! 🙂 Yum!! I haven’t had chili in so long. I really like the pumpkin in this – sounds delish! Easy and sounds really good. Can’t wait to try this recipe–just pinned it. I love using my slow cooker too. It makes dishes like this so easy. I have made simiar and LOVE pumpkin in chili! Your pictures are fantastic!